In tune with most of his recent work, Jean Paul Albinet’s “Sedimentação” [Sedimentation] revolves around a thematic triad dealing with the main challenges for the future: Art – Nature – Technology. 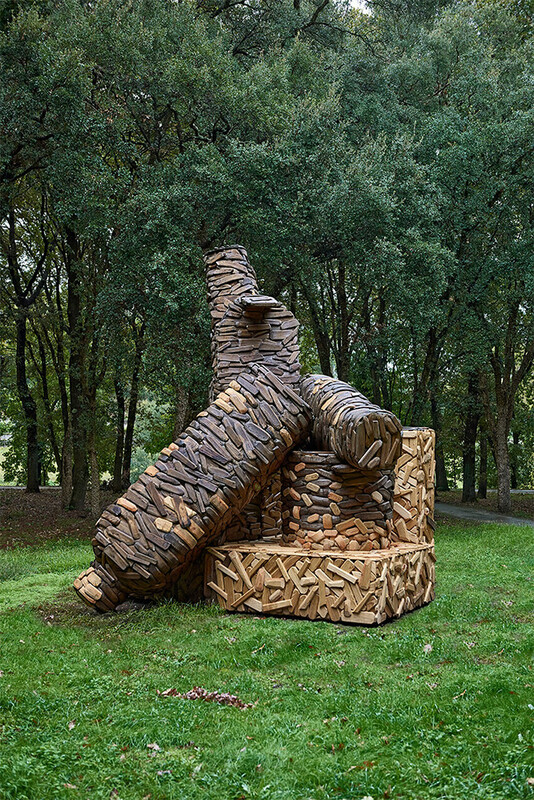 Due to its monumental size, this is an unusual piece, made up of a clutter of discarded ordinary containers built from wood fragments. Resembling an oversized heap of rubbish, Albinet’s sculpture questions untenable models of unbridled consumerism in globalised societies, by exposing the current culture of disposability and waste. By the same token, it advocates sustainable lifestyles, from sound eating habits to efficient waste management. The relationship between art and industry has been one of Albinet’s concerns for several years. In 1990 he was the first artist to ever sign his work using a machine-readable barcode (bearing no. 337731), which he developed as a conceptual identification sign, corresponding to his Suppliers’ Unified National Code number (CNUF) as manufacturer of painted and sculpted articles. According to the artist, this code, both a graphic and economic symbol, stands as the main signal of a globalised identity, and has become an ubiquitous element in his practice. Thus, through the appropriation of industrial uses, Jean Paul Albinet also challenges art authentication and certification procedures, giving a new critical perspective on the mechanisms governing the art world.